I’ve been to dinner. I’ve been to theater. I’ve been to dinner theater, cirque theater, no-fork medieval theater, Julia Child-learns-to-scramble-an-egg theater. But I have to admit, I have never been to a theater where my wine was poured by an aerial waiter who managed both bottle and glass while dangling upside down from above. That’s just a hint of the fun the crowd is having at the Lookingglass Theatre, where “Rick Bayless in Cascabel” is now playing. It’s a show featuring Chicago’s celebrity chef of Mexican cuisine, Rick Bayless, as — you guessed it — the cook. The character is whipping up a special dish as if his life depended on it. We, the audience, are guests at the inn, which we learn has some pretty magical qualities, not the least of which is the food that keeps appearing before us. I would tell you that I went into contortions over the beef mole and the Oaxacan chocolate cake, but in this crowd one must use such acrobatic words carefully. 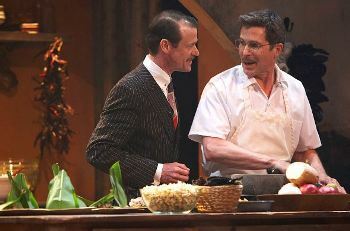 It’s a premise of the play that food sends the inn’s residents and visitors into paroxysms of ecstasy and predicament. Thus a bather arises in body bending ballet atop a single faucet, a waiter makes an emergency change of garments on a high wire and a young woman twirls skyward on a chandelier. These are charming, often wordless vignettes of love and longing that you might expect to find in any random assortment of souls at a way station on life’s journey. If what I’m describing sounds like a plot that stitches one scene to the next as loosely as “Love Boat,” well, bingo. These highly professional creators have landed on a formula for entertainment that could – given the right mesmerizing mix of food, music, acrobats and plot lines — go on and on and on and on. The show is pricey — $200-250 a ticket. One could ask who’s going to pay such a toll for something that’s essentially upscale dinner theater. But that would be missing the point. “Cascabel” has nothing to do with ordinary food; the menu is the creation of Bayless, who has a huge following for his Mexican haute cuisine at Chicago’s upscale Topolobampo. 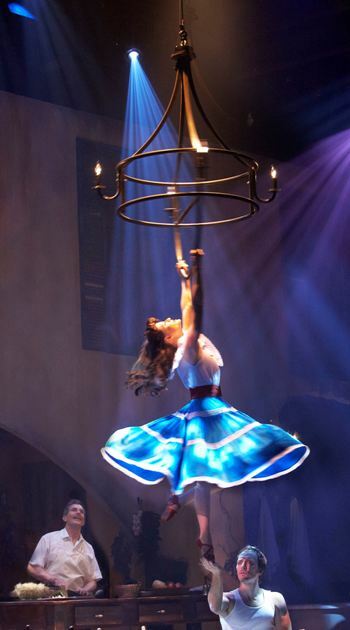 The show itself is a sibling in spirit to a Vegas cirque spectacle. Its aerial mastermind is Tony Hernandez, whose live action theatrical circus company Silverguy – in tandem with Lookingglass ensemble member and director Heidi Stillman — created the hybrid Greek myth aerial circus tale “Hephaestus” in 2010. That one was a strictly visual feast. 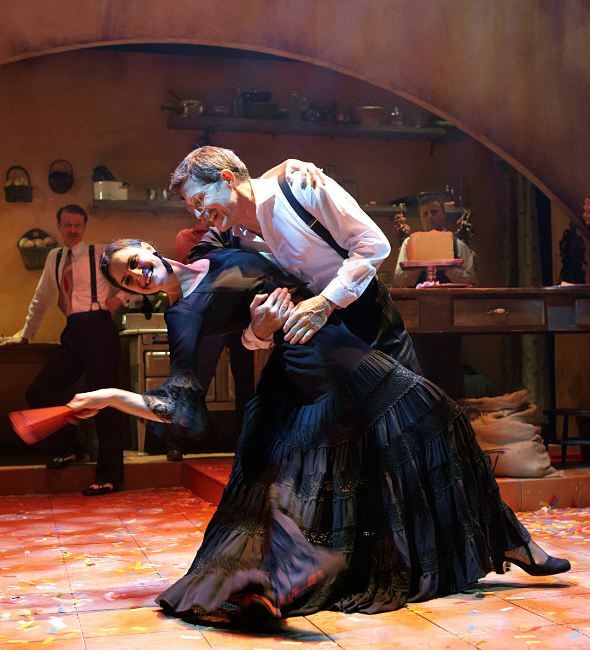 Stillman and Hernandez have paired again for “Cascabel”, showing the richness of their experience as they blend yet a few more kinds of high-flying talent from the wider theatrical realm, in addition to the brand-name cook. These include flamenco-influenced music of guitarist Carlo Basile, the food pranks of clown duo Anne Goldmann and Jonathan Taylor, the magnetic attractions of acrobatic dancers Nicolas Besnard and Shenea Booth, the balancing acts of contortionist Alexandra Pivaral and the flamenco footwork of dancer Chiara Mangiameli. Mangiameli plays a reclusive Señora who is harboring painful memories, and her story is supported by some fine actors of the more traditional variety – Lindsey Noel Whiting as the Señora’s daughter, Thomas J. Cox as the Señora’s over-determined suitor and Jesse Perez as the audience’s jovial interlocutor and maître d’. Circus performers call themselves artists, which to my mind these performers all are, given the sustained wonder, delicious fun and helpless laughter they have induced here. “Cascabel” is a gangbuster show for the culturally intrepid. As for how you define it, well, it’s niche resistant. But that what hyphens are for.